Our Rite 13 class combines several curriculum to meet the needs of our youth. The high point of the program is the Rite 13 Liturgy which is celebrated by our students in 7th or 8th grade with instruction beginning in 6th grade. The Liturgy recognizes that our young people are beginning the road to adulthood and allows the congregation to recognize and support them on their journey. 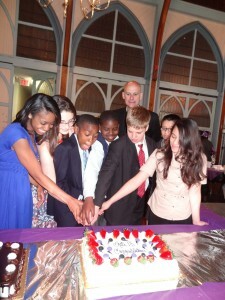 The students invite their friends and plan the reception that follows the service. Classroom time explores scripture, modern life and service. Friday movie and pizza nights are held once each month. We encourage all of our youth to fully participate in Diocese wide events to explore the wide range of opportunities and leadership experiences that are available. Christophany, Middle school Retreat, and Peer Ministry Training are offered to our Middle school Youth.